Some runners never get the credit that their running deserves. Were you to ask any road running athlete to name as many SAAA marathon champions from Aberdeen as they could, then everyone would come up with Alastair Wood, Fraser Clyne and Colin Youngson, some would add Graham Laing, some would make inspired (but erroneous) guesses at Don Ritchie and Rab Heron but not many would come up with Peter Wilson. Peter has had a fairly distinguished career with two marathon medals and a place in the Aberdeen team that set the record for the John o’Groats to Land’s End Relay in 1982. The picture above is from that race, with Peter fourth from the left. As a Scottish marathon champion, for most clubs in Scotland he would be a totally unique figure, while in Aberdeen he is one of many. What follows is mostly, but not entirely, from ‘A Hardy Race’ by Fraser Clyne and Colin Youngson (2000). 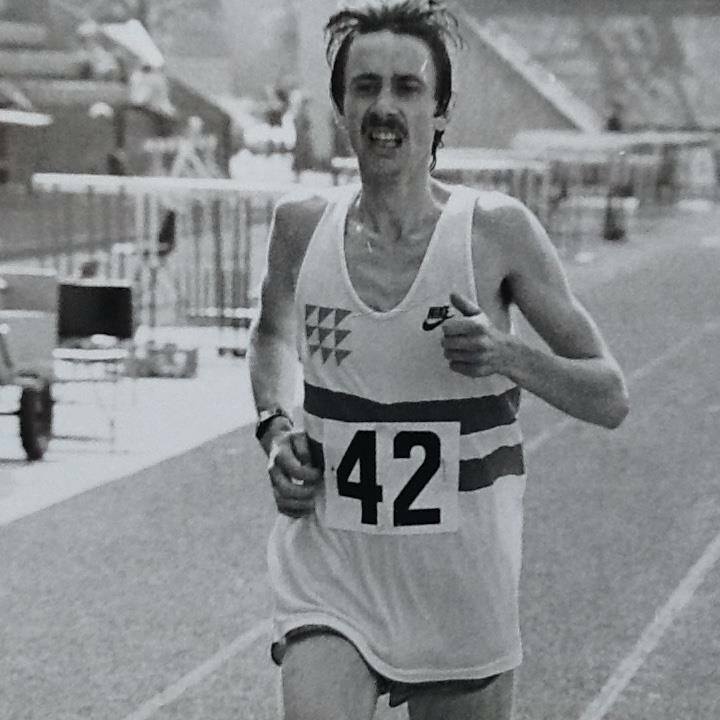 Although 1983 was to be the year he won the SAAA Marathon, he had a good year in 1982 when, on July 10th at Grangemouth, he was third behind Colin Youngson (2.18.02) and Sandy Keith (2.26.34) in 2.27.01. 1983 started with a good run in the London Marathon in April, when he ran a personal best of 2.20.05 to set himself up for the Championship, which was to be run from Edinburgh. The top three runners, based on form and times, were Colin Youngson (Champion in 1975, 1981 and 1982), Evan Cameron and Peter Wilson. Youngson had the incentive of having won the previous two championships, and while there is always real prestige from three-in-a-row, it would also equal Joe McGhee’s record series of victories. Unsurprisingly he went straight to the front and by five miles he had 30 seconds on his younger rivals, but unfortunately he had a stomach bug which decided to make its appearance during what the referred to as his ‘pit-stop marathon’. Despite having to stop three times, he was 80 seconds up by 18 miles. ‘A Hardy Race’ takes up the tale: “Dehydrated and exhausted, Youngson could not muster any fighting spirit when his clubmate Peter Wilson, who had paced himself well, and sensing victory had closed rapidly, strode past strongly and went right away. The result was: first Peter Wilson (2.26.20); second Colin Youngson (2.28.46) and third Evan Cameron (2.29.30). Peter Wilson had a fine record in the Edinburgh to Glasgow Relay. He first represented Aberdeen AAC in 1980, running Stage Five and holding on to 4th place, although the team eventually finished 8th. In 1981 Aberdeen won a bronze medal, with Peter fifth fastest on Stage Four. Another bronze was obtained in 1982, with Peter running the First Stage. 1983 was the year when Aberdeen AAC achieved a glorious victory, after a real battle with Bellahouston Harriers. Peter did well to hold on to a narrow lead on the windswept Stage Five. Then in 1984 Peter ran the Last Stage but Aberdeen could only finish fifth. After that, Peter Wilson moved to Edinburgh and joined the famous Edinburgh Southern Harriers. He was given the responsibility of anchoring his team to second place behind the oddly-named Kangaroos, a guest team of multi-national USA-based stars. Peter ran faster than his American opponent! Surely ESH received the gold medals they deserved. Peter was very much a specialist road-runner and less confident on the country. Nevertheless he featured in the Aberdeen team which won the East District CC title twice (in 1982 and 1983); made the top fifty in the National CC twice, and in 1982 was one of the AAAC team-mates who were pleased to win bronze, even without Fraser Clyne, who was usually their top man, in that event. His best track performance was a 10,000 metres at Balgownie, Aberdeen, in a fine 30.28. This was only a month before Peter’s 1983 Scottish marathon victory, and demonstrated his good form. On the roads, his fastest half marathon was an outstanding 66.11 at Fraserburgh in October 1984. The 1983 Scottish marathon course was certainly slower and more challenging than the old Commonwealth route. It was a variation on the 1981 course, starting and finishing at Meadowbank Stadium, but turning left at the Portobello roundabout before plodding through Granton followed by two hilly loops around Cramond, back through Granton, then steeply up Craigentinny Avenue and right for the finish. Peter was the proud winner of a special-designed gold medal, to commemorate the centenary of the Scottish Amateur Athletic Association. 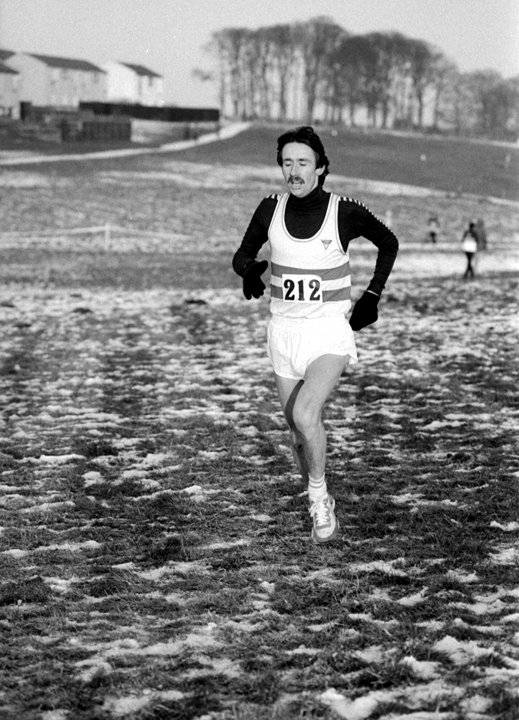 In 1984 he wore the Scottish vest again in the hilly and very competitive Barcelona International Marathon, finishing second Scot (21st in 2.21.42), behind Lindsay Robertson but once again well ahead of Colin Youngson. The Scottish team was third. In 1985, Peter managed 2.26.31 at Dundee. He ran again for Scotland in the gale-torn Aberdeen Marathon in 1986, when he was 7th and third Scot. Unfortunately, Peter Wilson suffered a bad bicycle crash in Edinburgh. Although he eventually made a good recovery, he did not return to the marathon. Back in Aberdeen, this dedicated man, with an extremely dry sense of humour, remains very fit, and in recent years has become a fearless rock-climber and motor-bike circuit racer! However – word has reached me from Colin Youngson that after a 22 year break, theis former Scottish marathon champion and sub 2:20 runner is back running seriously again. Lookout vets everywhere!